We all know how Walt Disney revolutionized the amusement park industry when he opened Disneyland in 1955. 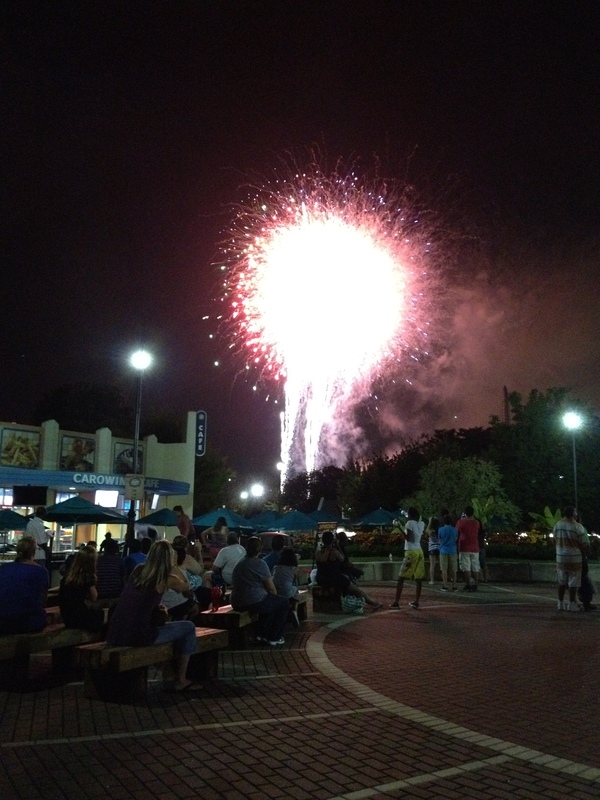 What most people don’t know is how many parks tried to copy the Disneyland model and Carowinds was one of those parks. Earl Patterson Hall visited Disneyland in 1956 and he was so inspired by that park, that he decided to open his own park that celebrated the rich history of the Carolinas. 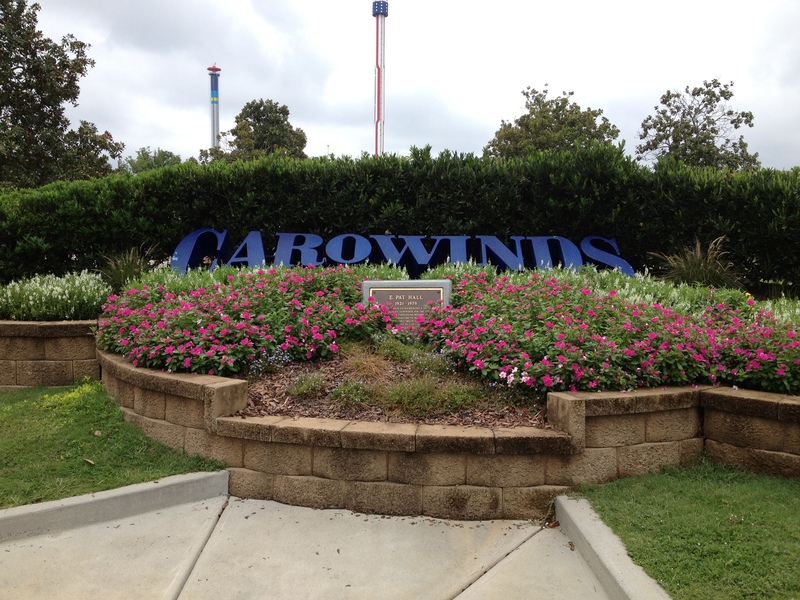 Carowinds was built over a four-year period at a cost of over $70 million dollars and opened on March 31, 1973. 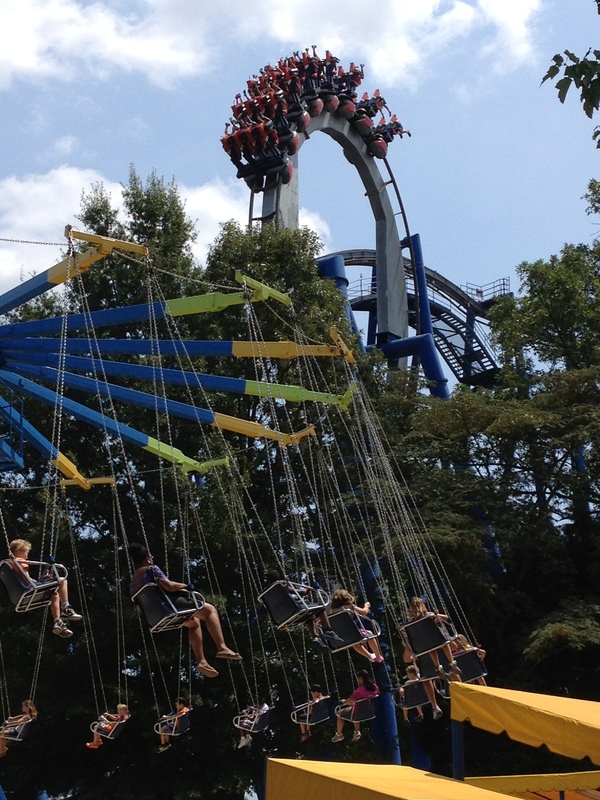 Carowinds is the only park in the United States that sits in two states, North Carolina and South Carolina. The park is 398 acres and sits just west of Interstate 77 just south of Charlotte, NC. The original plan for the park were to include a football stadium, hotels, and a golf course. One of those hotels was to be connected to the park via a monorail that actually operated in the park until the 90’s. Unfortunately, the oil embargo of the 70’s forced the company to reevaluate their plans and the hotels, stadium, and golf course were all eliminated. In 1975, the park was sold to Taft Broadcasting due to the mounting debt the park had incurred during construction and the sagging attendance during the embargo. 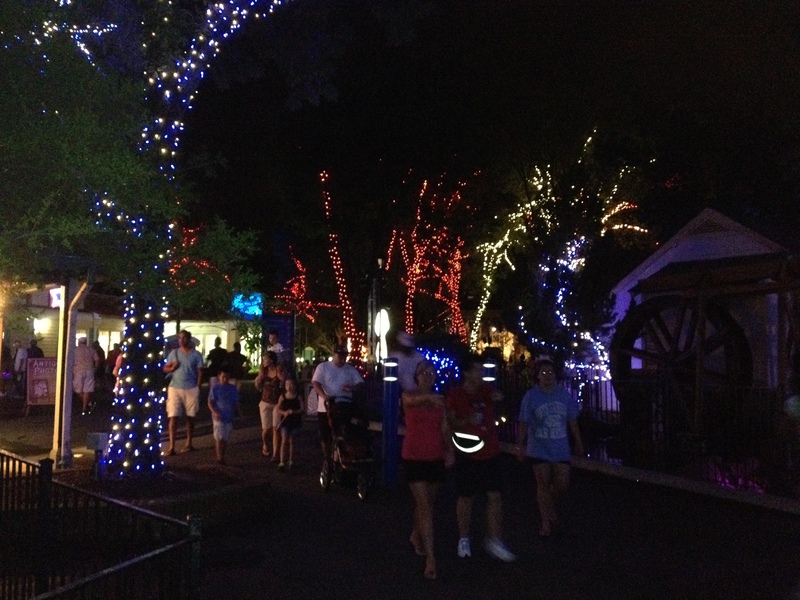 Taft Broadcasting also owned King’s Island near Cincinnati, OH and King’s Dominion near Richmond, VA. Eventually the parks were sold to Paramount in 1993 and they added their name to the parks name becoming Paramount’s Carowinds, then the entire chain was sold to Cedar Fair on January 26, 2006. 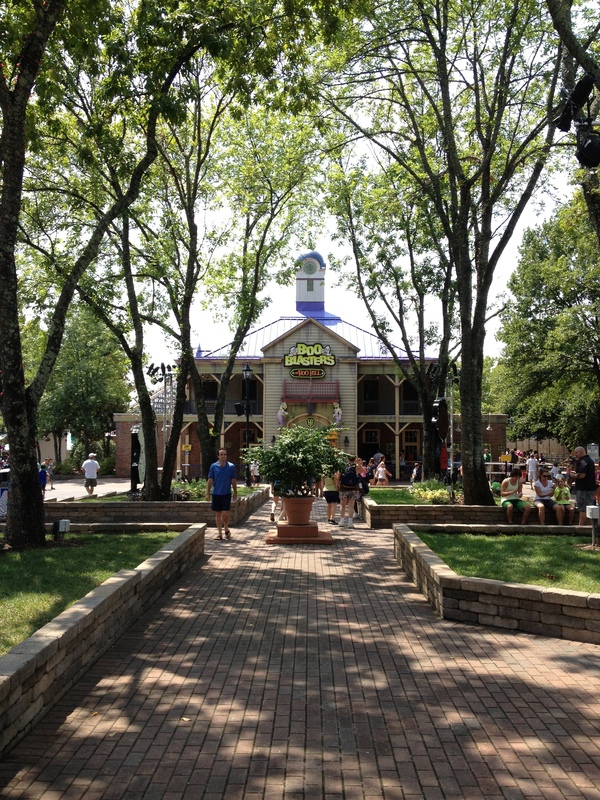 Cedar Fair owns a chain of parks that includes Cedar Point in Sandusky, OH, one of the nations oldest amusement parks. 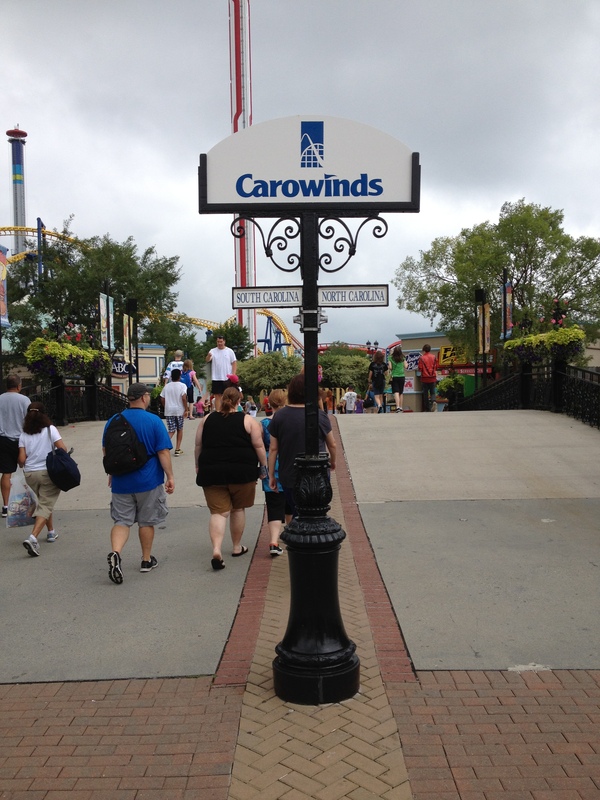 the name Carowinds was derived between the two states it sits in, and the winds that blow through them. But before we go through the gate, I need to let you know that they do have kennels available on a first come, first serve basis and there is a charge. You do need to bring your own bed, food, and water bowl. They WILL NOT walk or feed your pet so you’ll need to do that yourself. You’ll also need to clean up after them if they have an accident in the cage. With that being said, let’s venture into the park. The state line that runs through the park is marked in the entry plaza by a brick line. 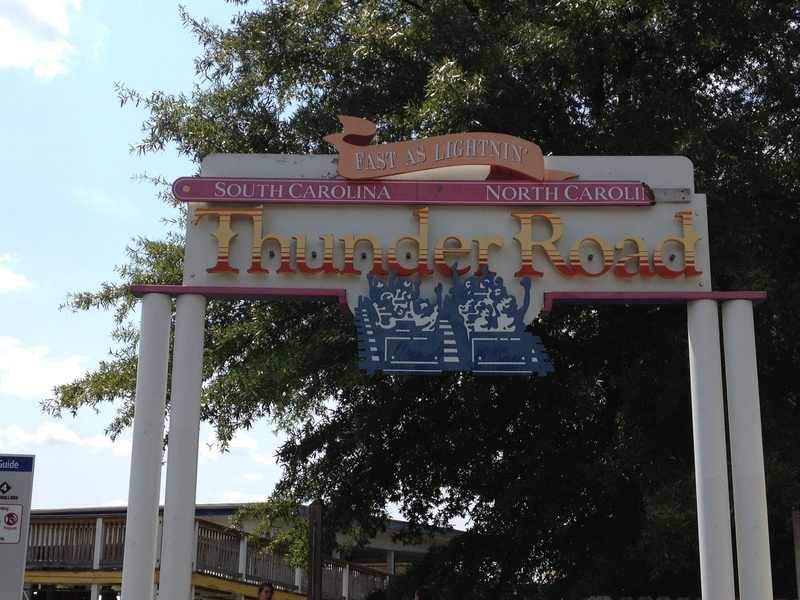 There are a number of different coasters that cross the state line, the first one was Thunder Road, a twin out and back, racing, wooden roller coaster. 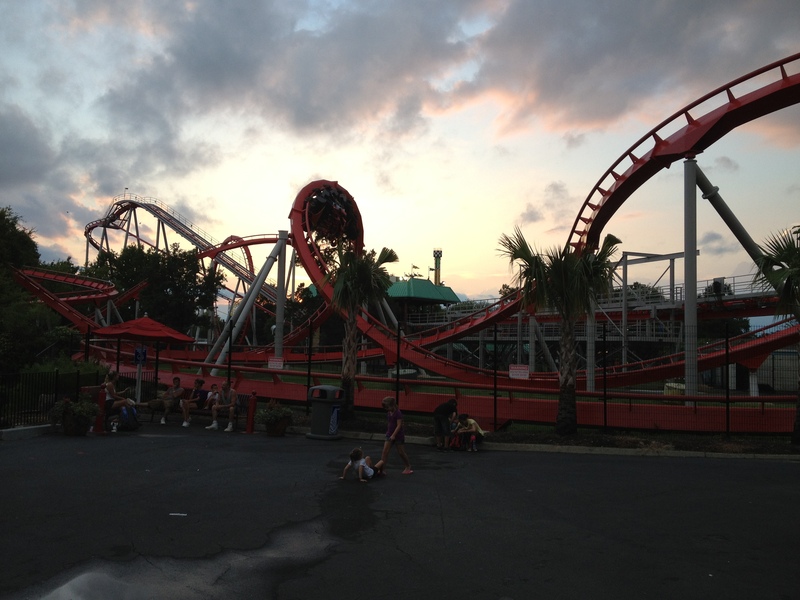 The others are steel roller coasters called the Carolina Gold Rusher and Nighthawk. 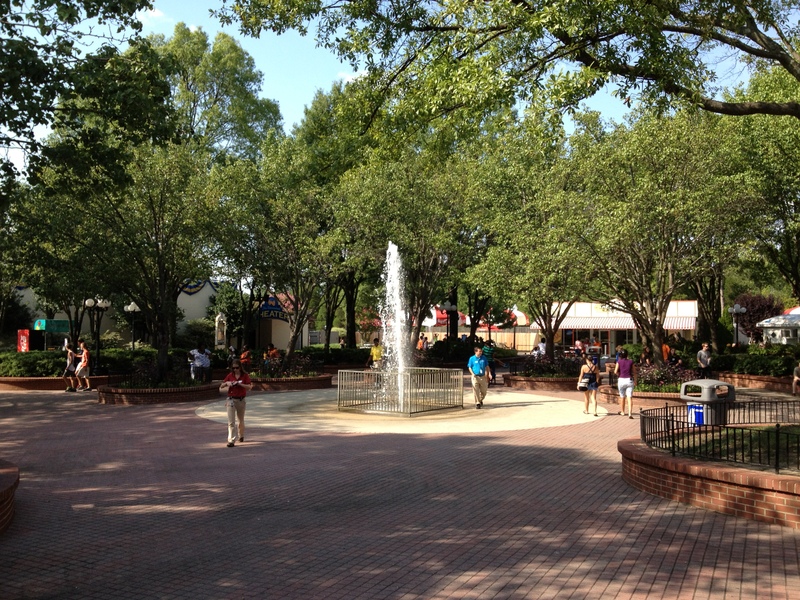 Carowinds is divided into seven areas and they are Carowinds Plaza (main gate), Carolina RFD, Carolina Boardwalk, Carolina Showplace, County Fair, Thrill Zone, and Planet Snoopy and we’ll begin our journey in Carowinds Plaza. 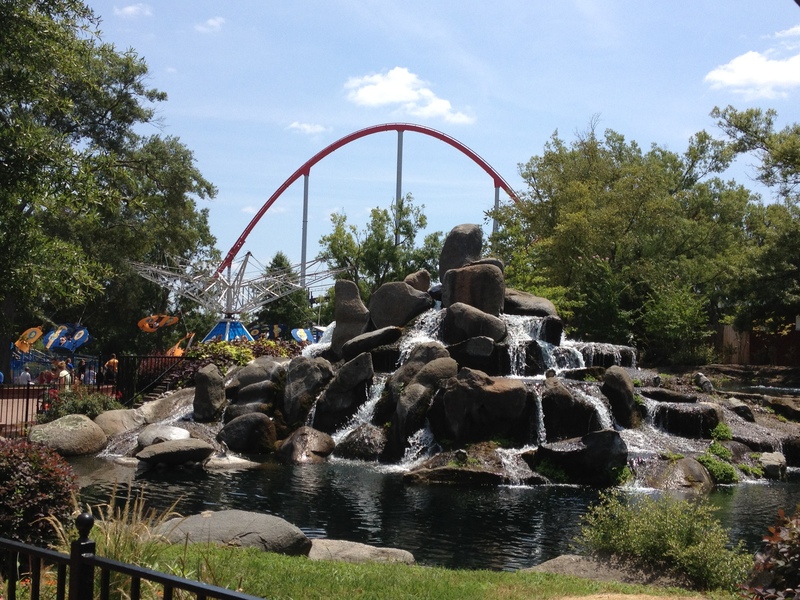 This area contains four rides Intimidator, Carolina Skytower, Nighthawk, and Rip Roarin’ Rapids. 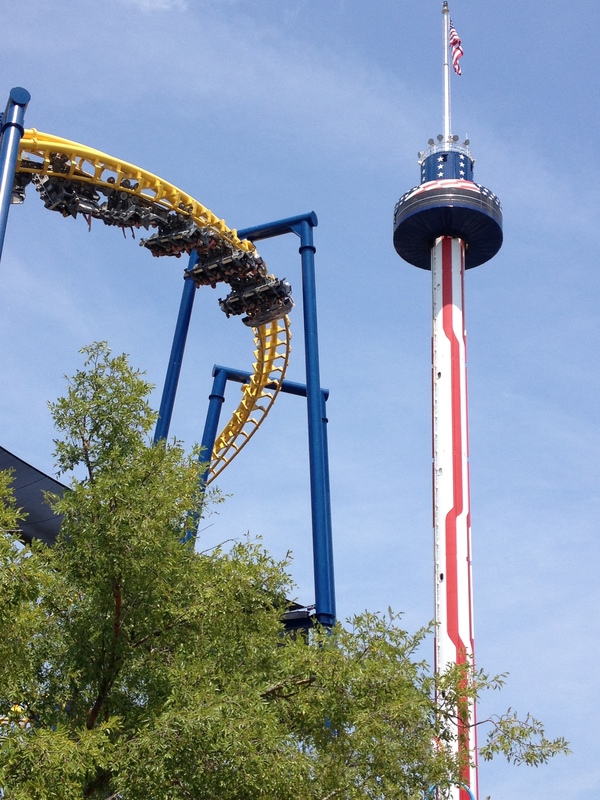 The Carolina Skytower was built by Intamin and is one of the three original rides that opened with the park. It’s a 262 foot tall observation tower that takes you on a air-conditioned trip to the top via a rotating cabin. Click on the link below for an on ride view. The next ride is called Rip Roarin’ Rapids, unfortunately I didn’t get any good off ride shots as this ride is fairly well hidden and I’m not much of a fan of getting absolutely soaked as these type of rides do very well. 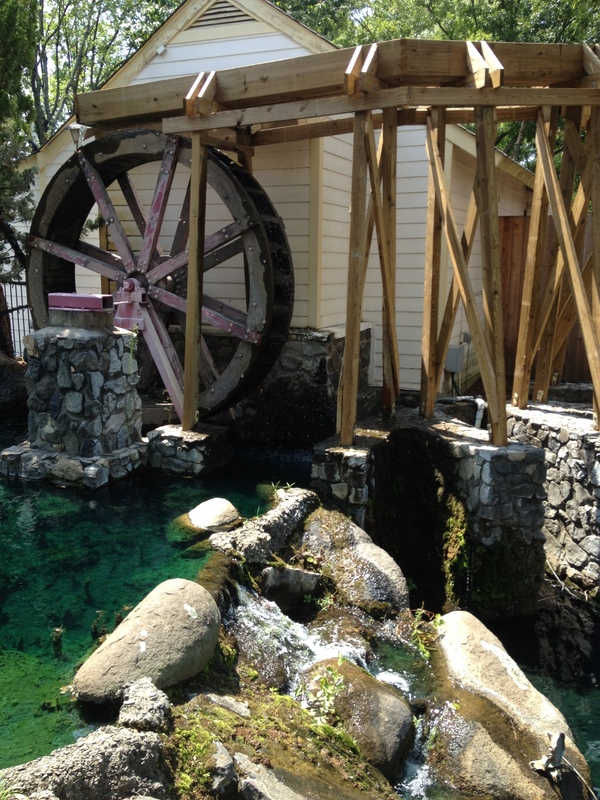 This ride is a river raft ride that utilizes circular rafts that float down an artificially created white water river that passes under waterfalls and water cannons that shoot water into the boat. I do believe this ride was also built by Intamin as well. The last two rides are roller coasters, this one is called Nighthawk. Nighthawk is the world’s first flying coaster and it was built by Vekoma. This coaster is considered to be a Flying Dutchman model and it was originally built at California’s Great America near San Fransisco, CA. 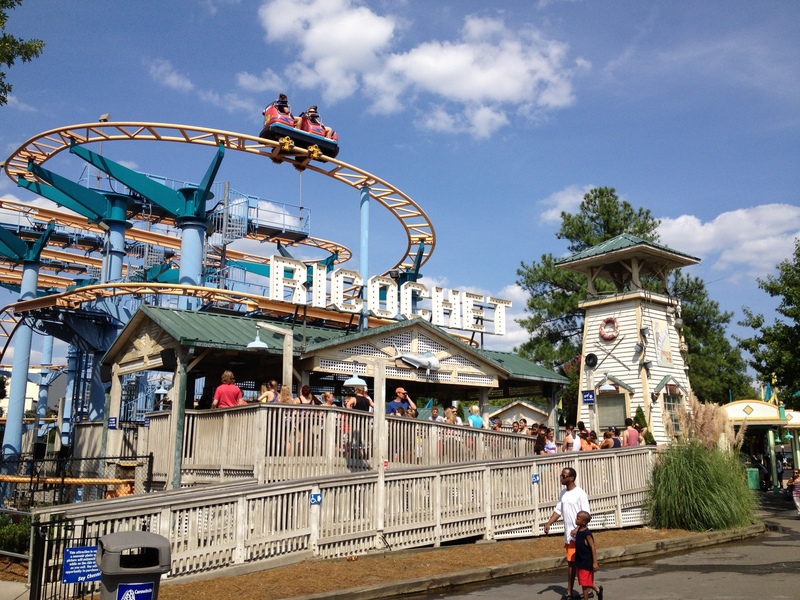 It operated there as Stealth from April 1, 2000 to September 2, 2003 when it was moved to Carowinds where it operated under the name BORG Assimilator until 2007 and then Nighthawk from 2008 to the present. Nighthawk is 2,776 feet long, is 115 feet high, has three inversions, a top speed of 51 mph, and a ride duration of one minute fifty seconds. There are several different elements on this ride including a horseshoe (pictured above), a 66 foot tall loop, and two corkscrews. Riders board the train in the station and are secured in their seats. Once that is accomplished, the seats then recline until the riders are in a fully reclined position. The train is then sent to the lift hill with riders lying on their backs with their heads pointed towards the nose of the train. once at the top, the train flips over from a “Lie to Fly” position in which riders are face down under the track in the flying position. 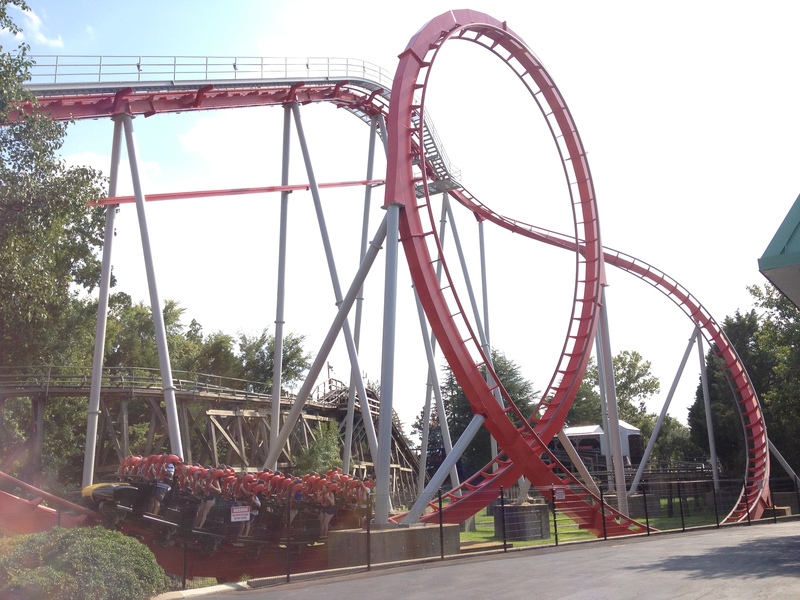 The train goes through two horseshoe elements and then goes from “Fly to Lie” to go through the loop and then from “Lie to Fly” to go through another horseshoe and two corkscrews, then the final “Fly to Lie” to enter the final brakes and then into the station. Watch the video below to see a off ride view of the entire ride. 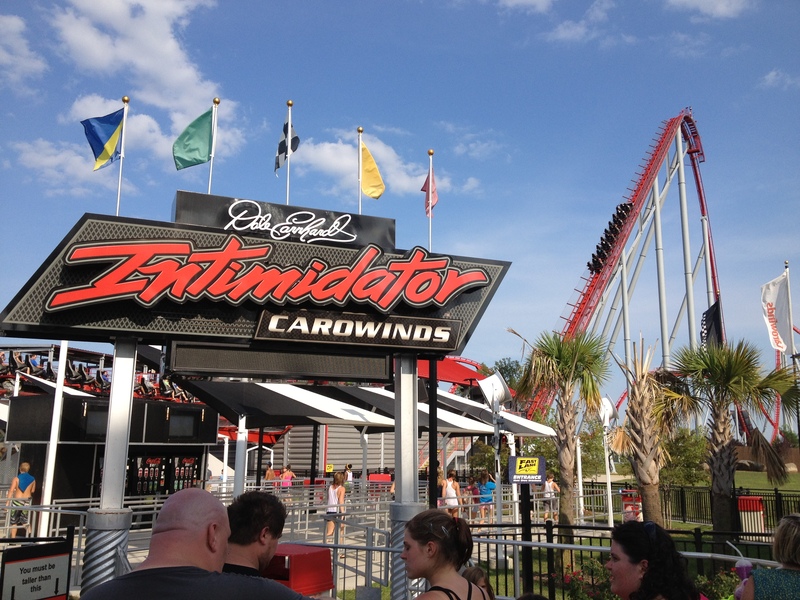 The next coaster is Intimidator, This is one of the best steel roller coasters I’ve been on. It’s from Bolliger & Mabillard (B&M) and it is very smooth and packs an incredible amount of air time, which when translated from coaster talk to regular English means a feeling of zero g when going over the tops of hills. 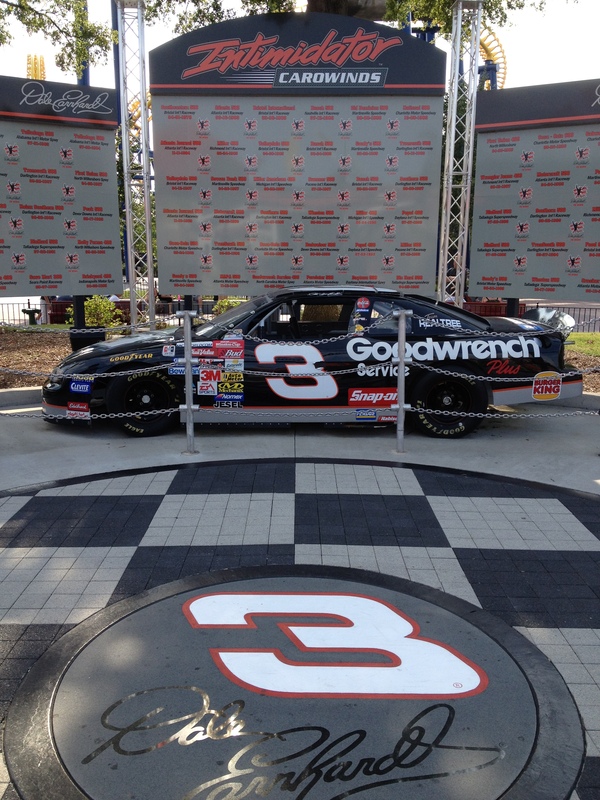 Intimidator was named after Dale Earnhardt, a legendary driver on the NASCAR Sprint Cup circuit whose nickname was the Intimidator. It opened on March 27, 2010 and is 5,316 feet long, has a top speed of 75 mph, a height of 232 feet, and a total ride time of three minutes and thirty-three seconds. click on the link below to see an off ride view of this coaster. 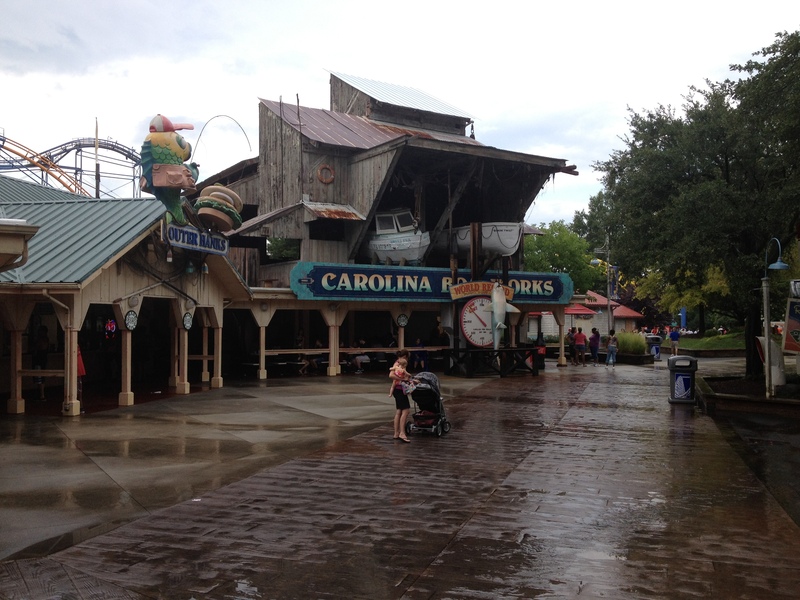 Next, we take a right and travel into North Carolina and enter Carolina Showplace. 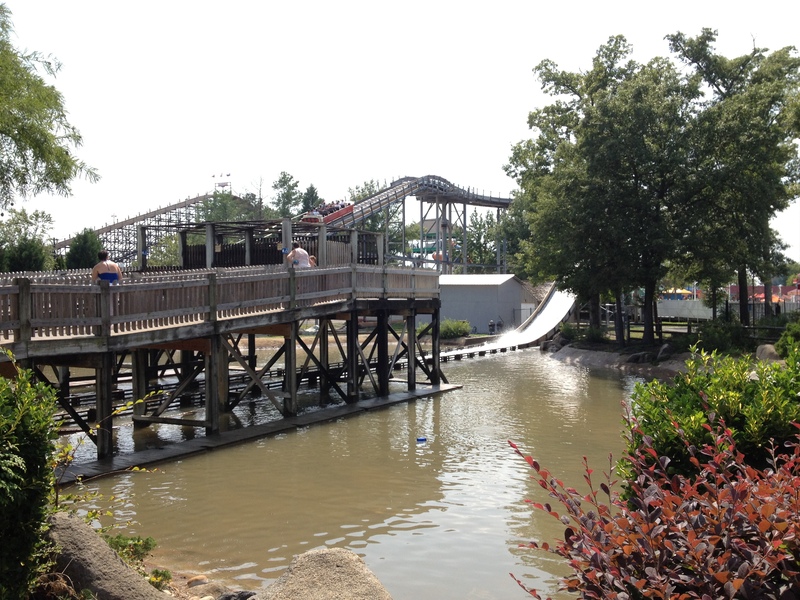 This area has just two rides one of which is a Eli Bridge Wipeout ride that was originally called Kaleidoscope and is now called The Scrambler. Unfortunately I didn’t get any photos or videos of this ride. The other ride is one of B&M’s first roller coasters called Vortex. 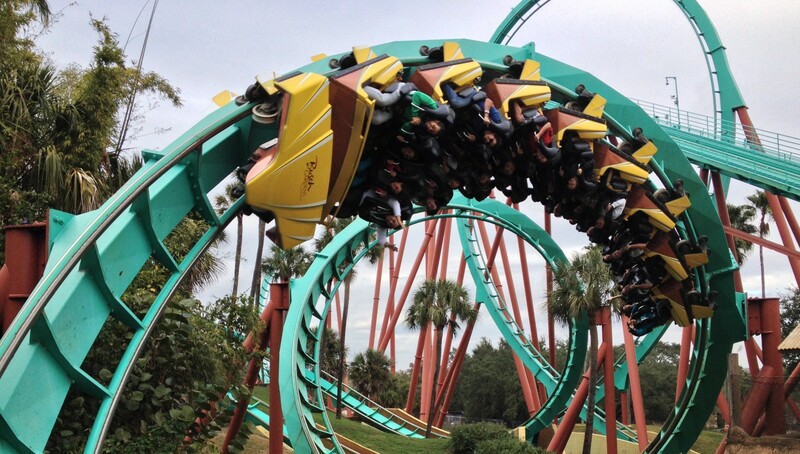 It’s a standup roller coaster that has riders standing, rather than sitting, throughout the whole ride. 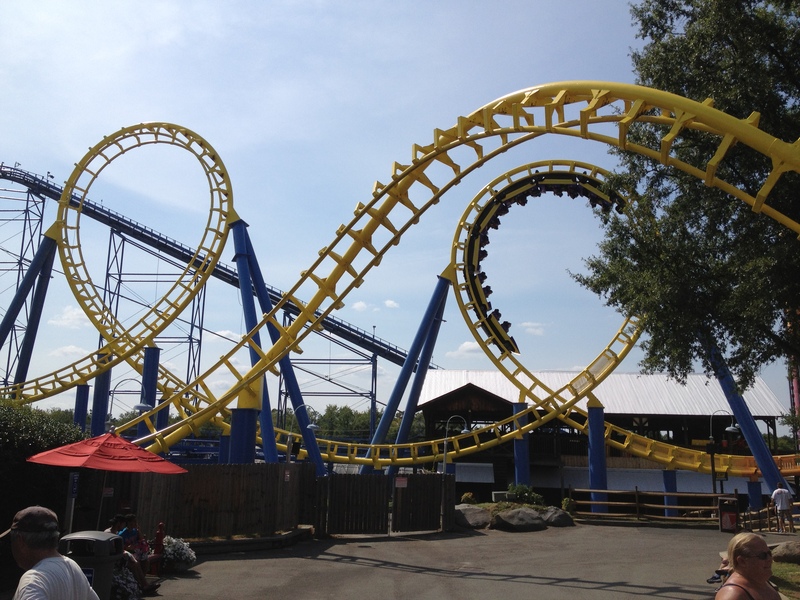 This one opened on March 14, 1992 and it has a total length of 2,040 feet, a height of 90 feet, a top speed of 50 mph, two inversions, and a total ride time of two minutes and eighteen seconds. Next up, is the Thrill Zone area which has four rides. The first ride we come to is a very rare Enterprise ride from the Anton Schwarzkopf company called Scream Weaver which opened in 1974. You might be saying that Enterprise rides are everywhere, and you’d be correct, they are everywhere. What you might be thinking of as a standard Enterprise ride is most likely from HUSS Mfg. There are only really three Enterprise rides from the Schwarzkopf Co currently in the US. There’s this one, the Enterprise at Fun Spot America (formerly Wheelie at Six Flags over Georgia), and the one at California’s Great America. Next up are the up charge attraction which are an additional charge to ride them, unfortunately I did not get any photos of these attractions. 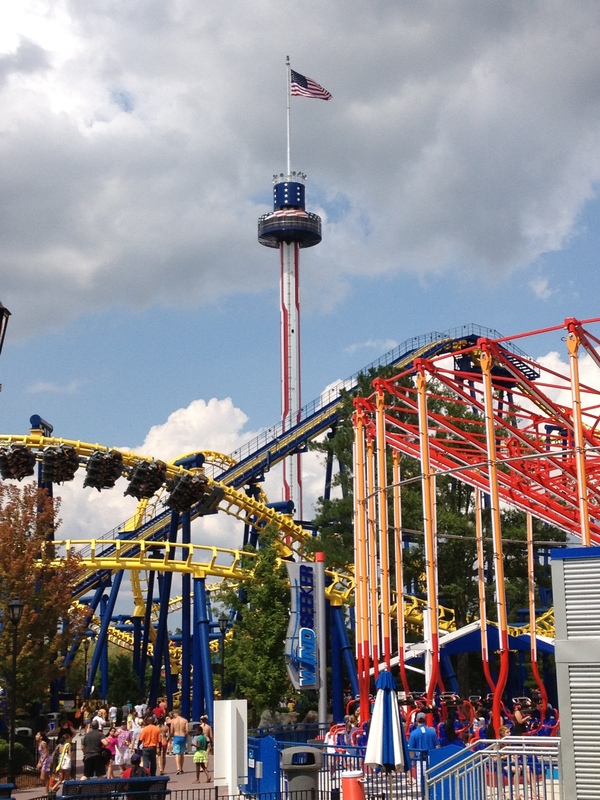 The first one is the Xtreme Skyflyer which is a pendulum swing attraction also called a Skycoaster. Riders are strapped into a harness, attached to two guide wires and raised to the top of a tower behind them. Once at the top, someone instructs the rider via a speaker to pull the ripcord that releases them from the tow cable. the riders then swing like a pendulum back and forth until they can grab a ring that raised by the ground crew once their momentum has slowed them down enough. They’re then released from their guide wires and harness. Then there is the Grand Prix Raceway which is basically a standard go-kart track. Next is a wooden roller coaster called the Hurler which was built by International Coasters Inc and opened in 1994. It was originally themed to the Wayne’s World movie when the park was owned by Paramount, the theming was removed when the park was sold to Cedar Fair. This coaster is a triple “out n’ back” coaster, meaning that it goes out to a point, turns around, and then comes back three times. It’s eighty-three feet tall, has a length of three thousand one hundred and fifty-seven feet long, a top speed of 50 mph, and a ride duration of two minutes. 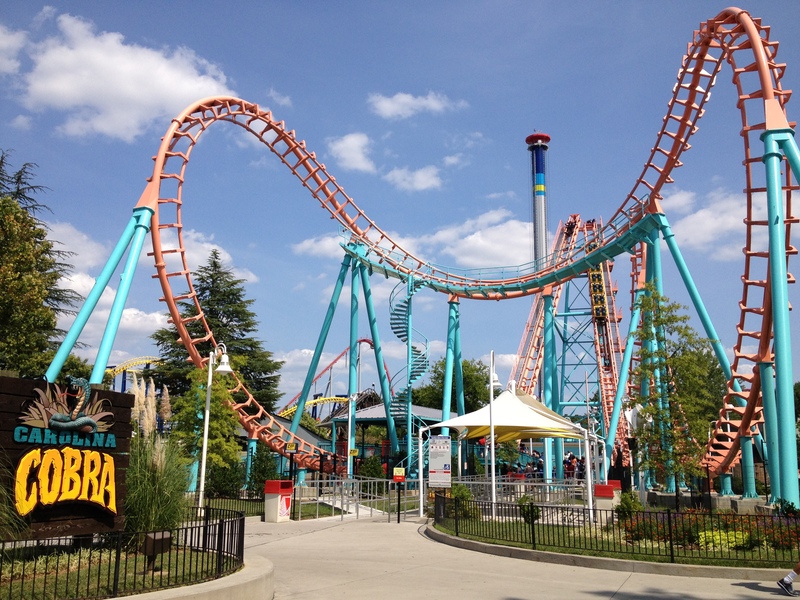 This coaster was one of only two that this company built and is considerably rough, the other one is a carbon copy of this one at King’s Dominion and it uses the same name. I rode it twice, once in the front and once in the back. It’s tolerable in the front and very rough in the back. Last in this area is the Drop Tower: Scream Zone, it’s a 160 foot tall drop tower with a 100 foot drop that was built by Intamin and opened 1996 under the name Drop Zone: Stunt Tower after the movie Drop Zone. It was renamed Drop Tower: Scream Zone after the park was sold to Cedar Fair. Click on the link below to see an off ride video. The next area is the Caroline Boardwalk are that has three rides and some really good barbecue sandwiches at the Outer Hanks Restaurant. 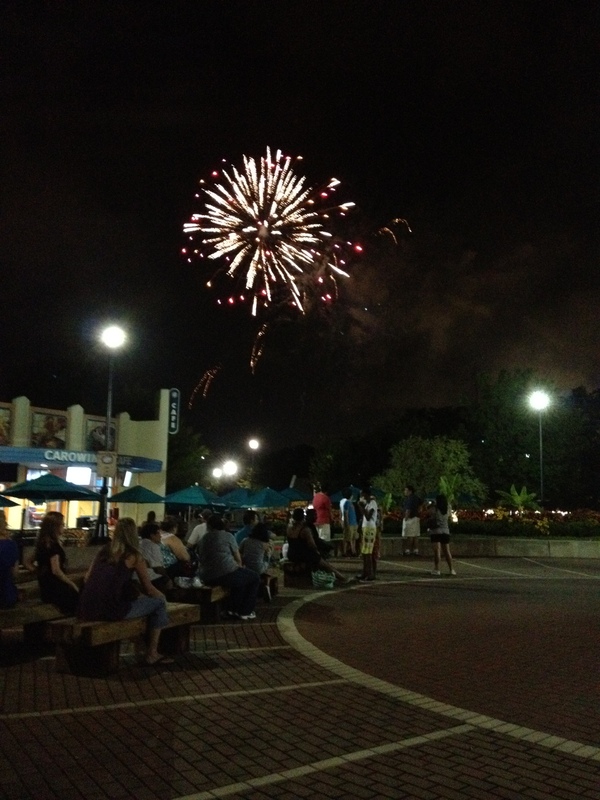 There’s a bit of Carowinds history in the photo below. The old Skyride station is still there and is being occupied by two boats where the gondolas would enter and exit and a covered seating area for the Outer Hanks Restaurant underneath. 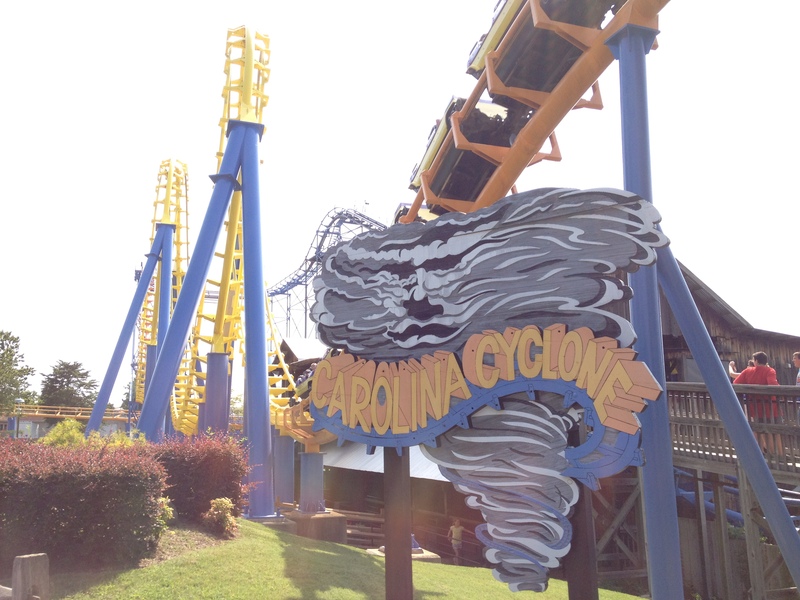 First up for the rides is Carolina Cyclone, it was built by Arrow Dynamics and opened in 1980 as the first steel coaster to go upside down four times with two loops and two corkscrews. It is 2,100 feet long, 95 feet high, has a top speed of 41 mph, and a ride duration of one minute and thirty seconds. Next is Ricochet, a Wild mouse coaster from Mack Rides. 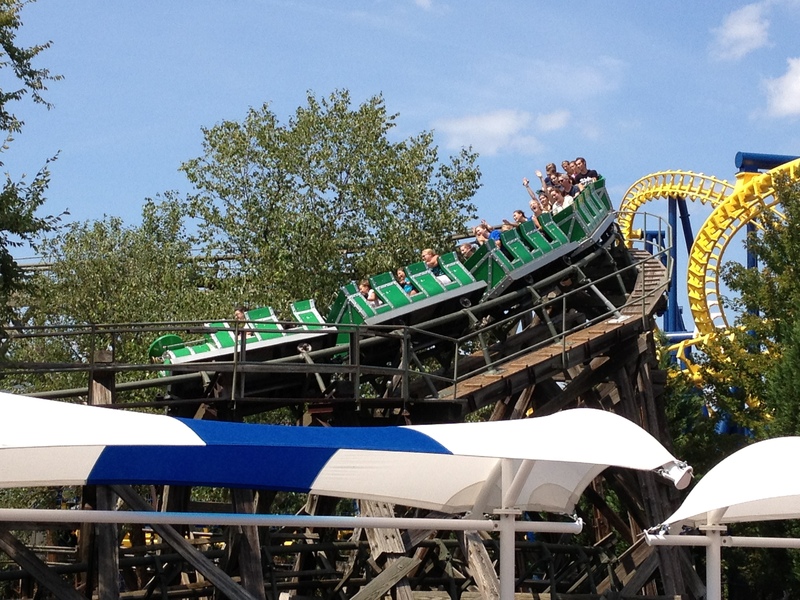 A wild mouse is a coaster that, although not very tall or fast, has quick turns and sudden drops. This one is one thousand two hundred feet long, has a height of forty-six feet and a top speed of 28 mph. 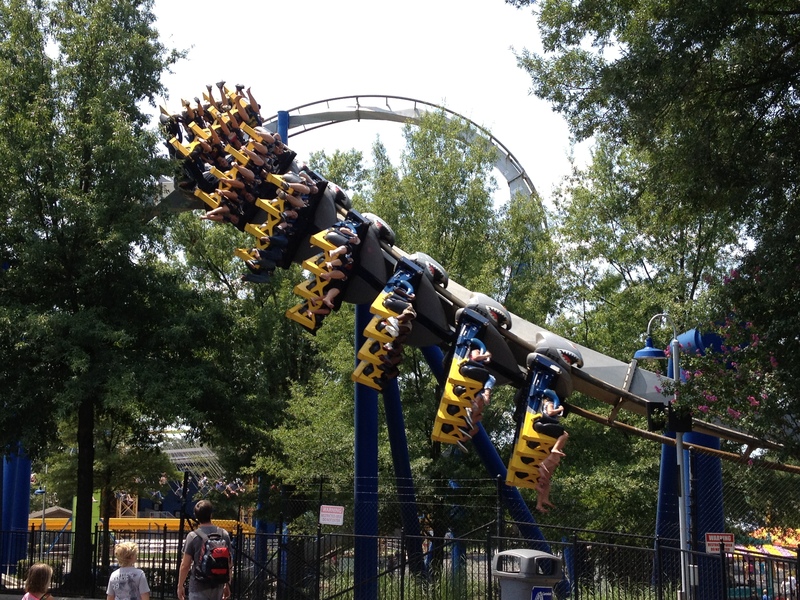 After that is the Carolina Goldrusher, one of the original attractions that opened with the park. This is a mine train themed coaster that was built by Arrow Dynamics. 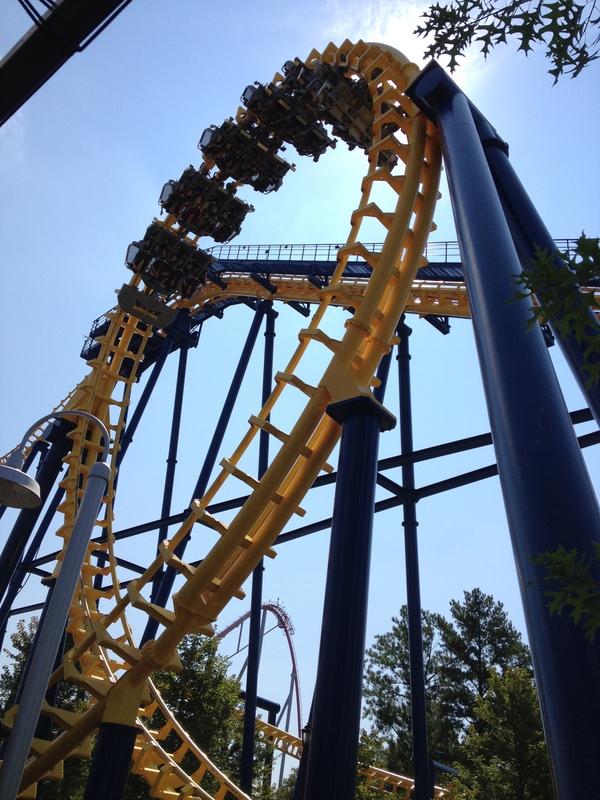 It has a total length of 2,397 feet long and a total ride time of two minutes and seventeen seconds. Next we enter the County Fair which has five rides and a theater. The Theater is the Action Theater which opened in 1994 and currently hosts a 3-D movie from Iwerks Entertainment Inc called Dinosaurs: Giants of Patagonia. There’s also a classic bumper cars attraction called the Dodg’ems and the Yo Yo, a Chance Morgan ride that was moved here in 2008 from the now closed Geauga Lake park in Aurora, OH. Next up is Thunder Road, It’s two racing wooden roller coasters in one attraction. One side is called North Carolina and the other is called South Carolina. 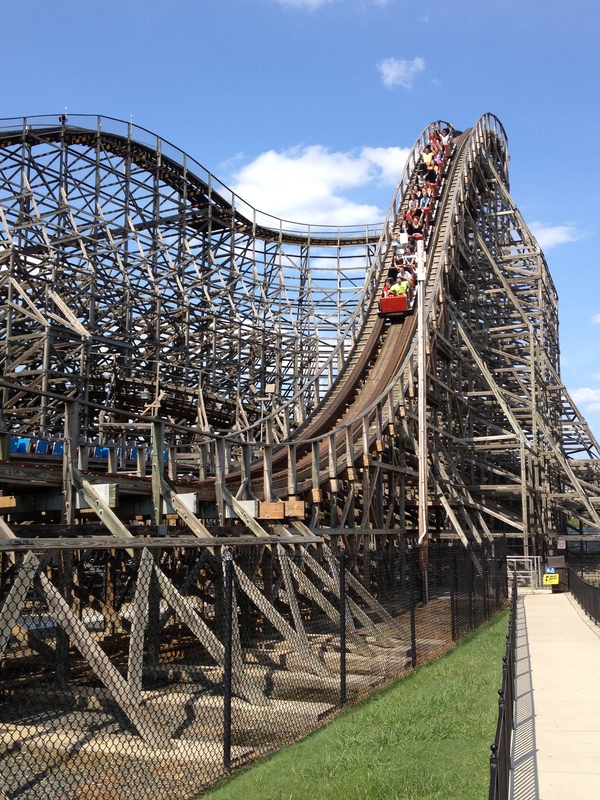 This ride was built by Philadelphia Toboggan Coasters (PTC), designed by Curtis Summers, and has a serial number of 155. It opened in 1976, has a length of 3,819 feet, a height of 93 feet, a top speed of 58 mph, and a total ride time of two minutes ten seconds on both sides. Next up is the Southern Star, A Looping Starship ride from Intamin that was formerly known as Frenziod. It opened here in 1986. 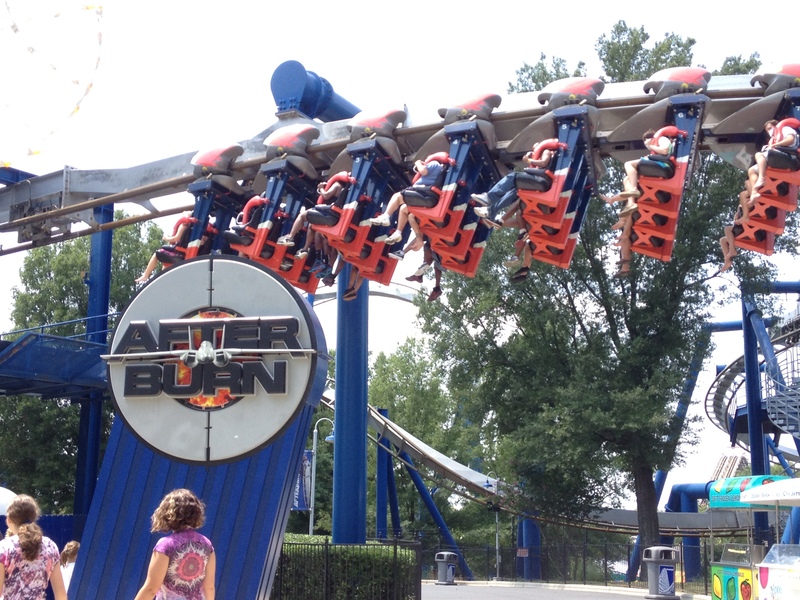 Last in this area is one of the best Inverted roller coasters from B&M I’ve ridden called Afterburn. 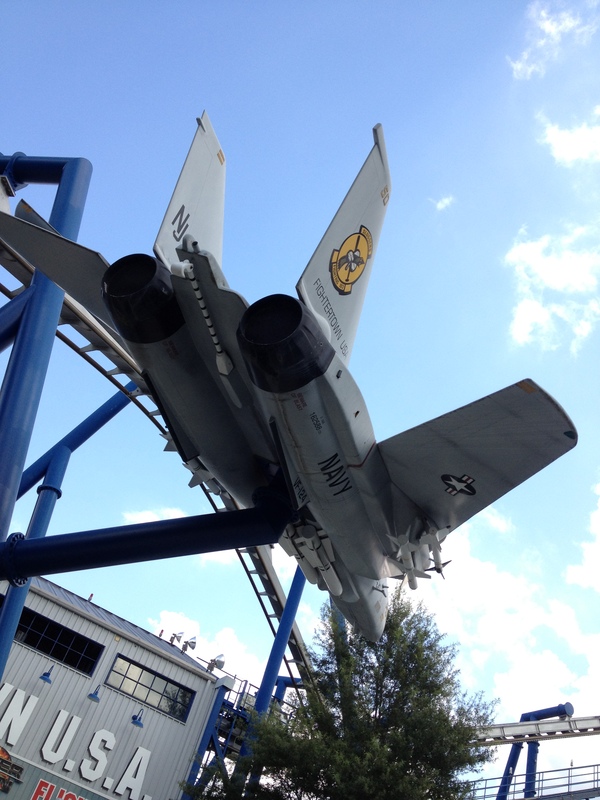 This coaster originally opened as Top Gun the Jet Coaster on March 20, 1999 until the park was sold to Cedar Fair 2007 when the ride was renamed Afterburn. This coaster was originally supposed to open with a Godzilla theme but that was quickly changed once the film bombed in the box office. 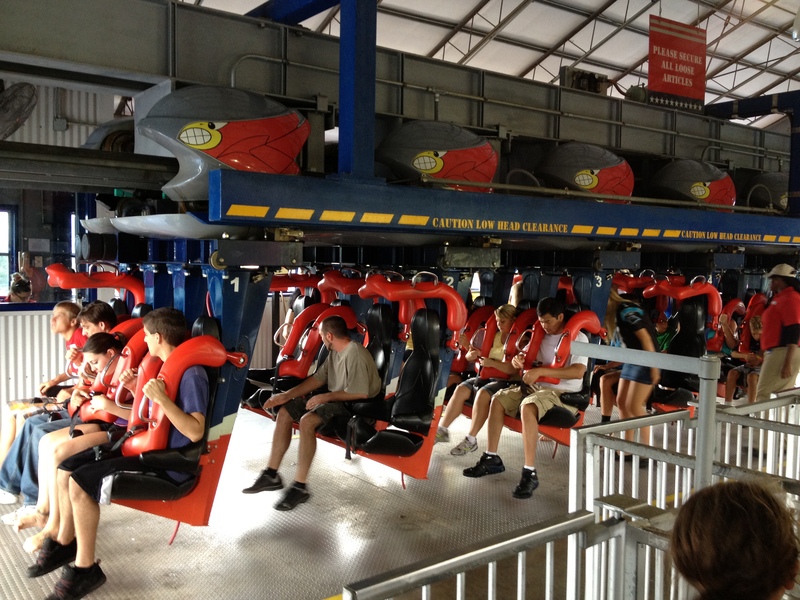 This coaster has riders hang from the tracks above them offering them an unobstructed view of the ground. 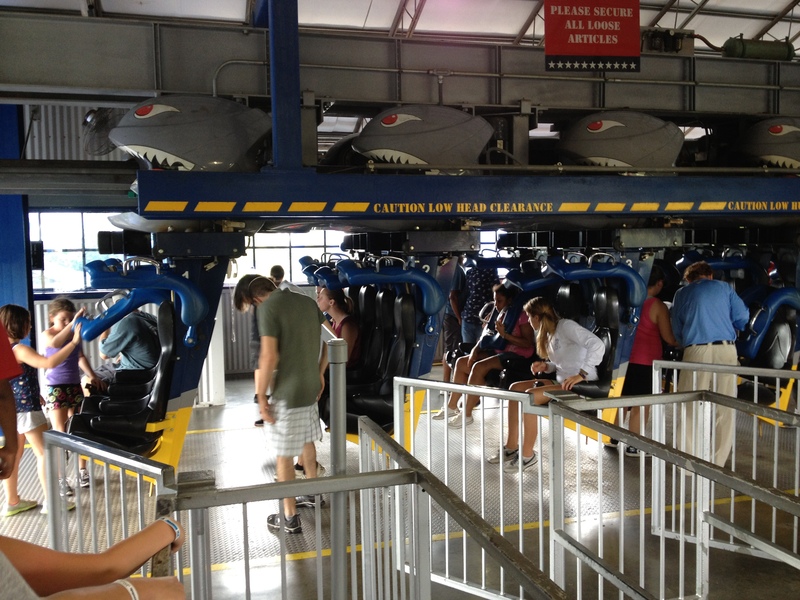 This coaster has a total length of 2,956 feet, a height of 113 feet, six inversions including a loop, Batwing (2 inversions), a dive loop, a Immelman, a zero-g roll, and a corkscrew, a total ride time of two minutes and forty seconds, and a top speed of 62 mph. 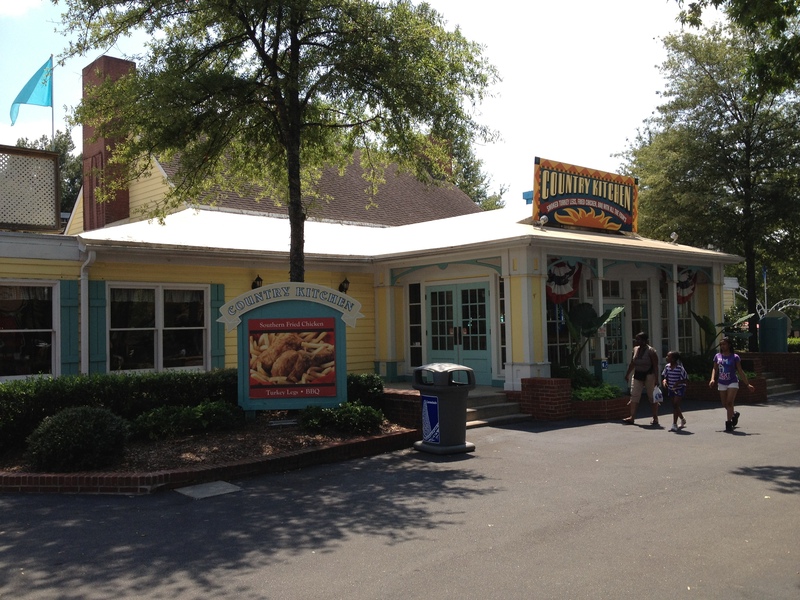 Next up is the Carolina RFD section which has four rides and a decent restaurant called the Country Kitchen. There’s a decent dark ride called Boo Blasters on Boo Hill and it was built by the Sally Corp and it opened here in 2010. It’s basically a dark ride where you shoot at targets in the ride. 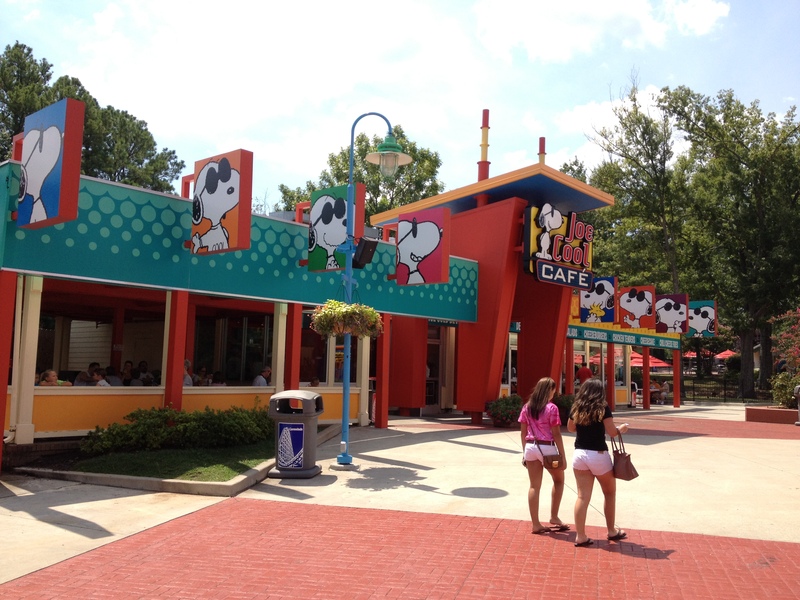 This building was also used as a theater that housed different shows until Carowinds converted it into a dark ride. This area is also very heavily shaded and has some decent scenery. 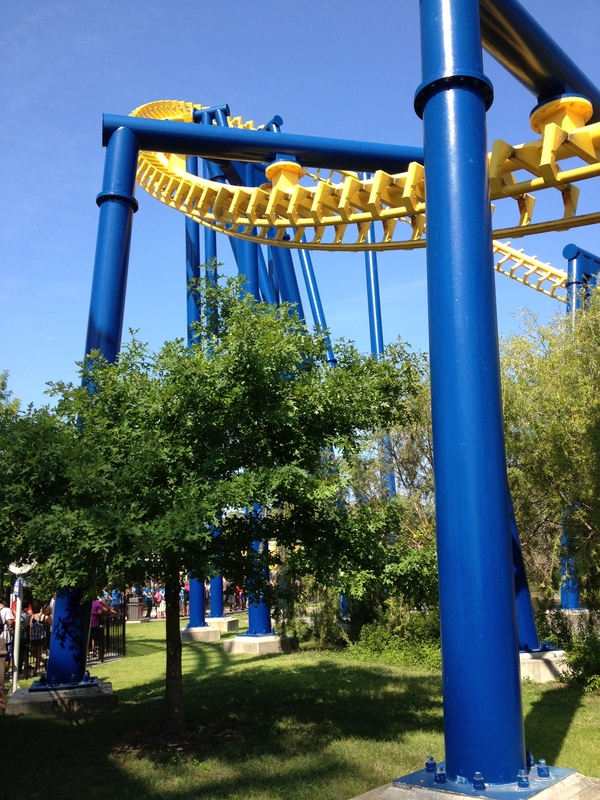 Next up on the rides in this area is the Carolina Cobra, a standard Boomerang coaster from Vekoma. This model is one of the most popular “off the shelf” coaster designs from Vekoma as it requires a relatively small footprint for those parks that want to have a steel roller coaster but just don’t have the room and it’s relatively inexpensive because it’s a mass-produced design. The operation is fairly simple, the train is loaded in the station and gets pulled backward by a cable up the “spike” and is then released once it reaches the top. 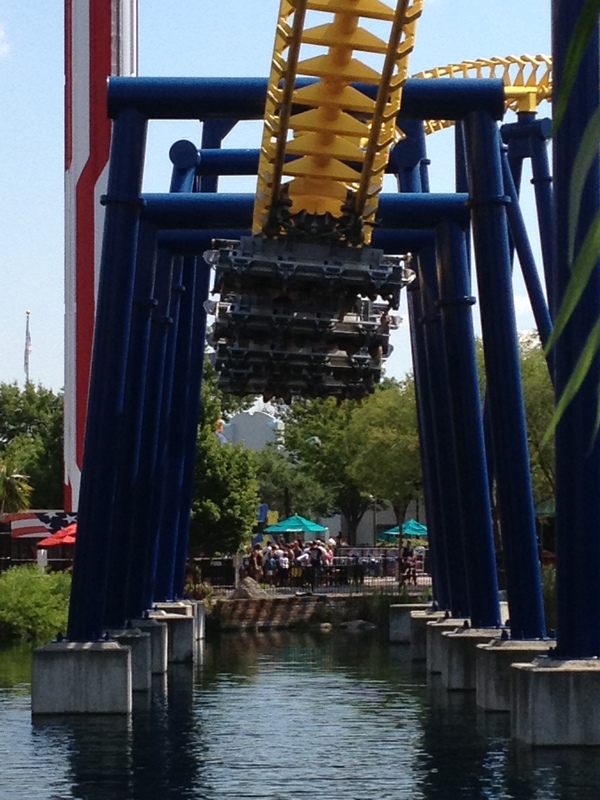 The train then rockets through the station, up through a Cobra Roll (2 inversions) through a loop then it gets pulled up to the top of the other spike by a chain lift. The chain lift then retracts, allowing the train to go through the course backwards back to the station. The only real drawback is the hourly throughput which is very poor since the coaster only has one train. These Boomerang coasters have a nasty reputation of being quite rough. I wouldn’t know as this is the only one I’ve been on so far. 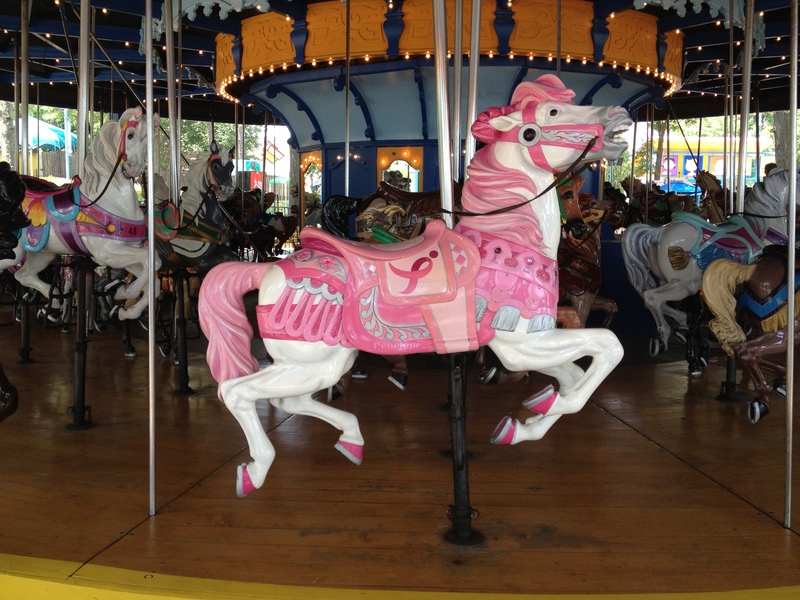 When I rode this one, I was quite pleased with the relatively smooth ride I had on this one. Vekoma had shipped Carowinds the new over the shoulder restraints which are more flexible than the ones that were on there before (so I’ve been told by other enthusiasts). This coaster also originated at the former Geauga Lake Park that was near Aurora, OH. It was built there and called Head Spin in 1996 when the park was owned by Six Flags. Cedar Fair bought the park sometime after that and then decided to close the park in 2007 after only a few years of operation. The coaster was then removed, refurbished, repainted, and had the new trains installed before being moved to Carowinds for 2009. 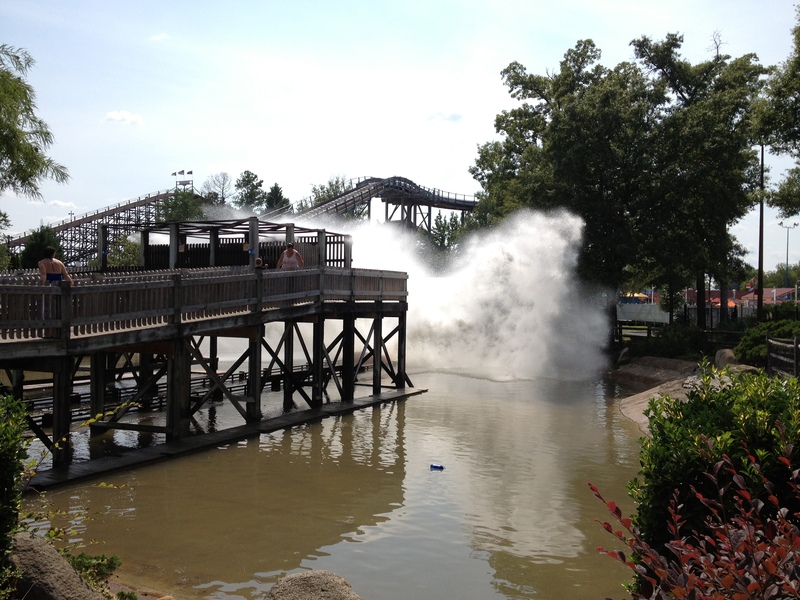 Then there’s a classic Shoot-the-Chutes ride from Hopkins Rides that opened here in 1988 called WhiteWater Falls. I think you can guess what happens here. It’s basically a fun way to get absolutely soaking wet on a ride and that means I didn’t go on it. Now we’re on to the newest addition to Carowinds at the time of my visit and this on is the tallest ride in the park called Windseeker. It’s a 300 foot tall swing ride that is set to some beautiful music. I’ve heard theme songs from ET the Extra Terrestrial, Superman, Star Trek, and even some classical compositions like a few selections from Modest Mussorgsky’s Planets. 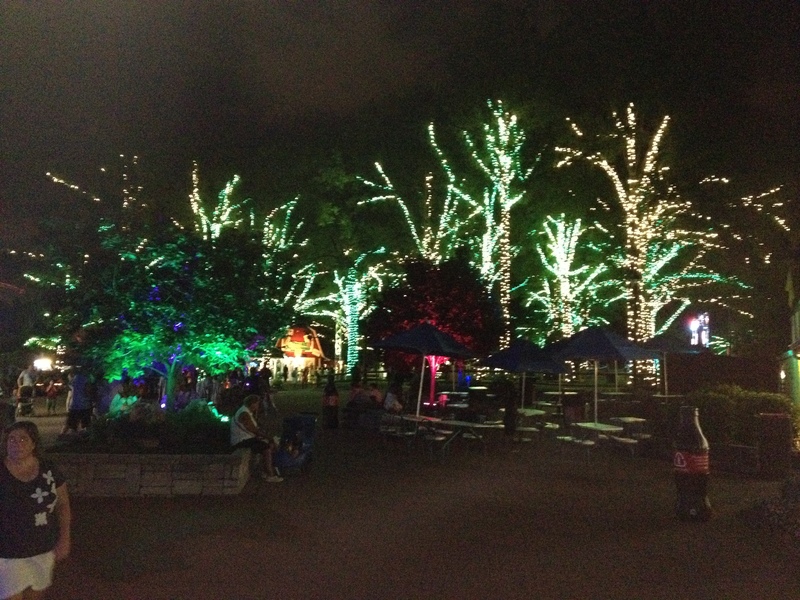 Here’s a day and night off ride view. 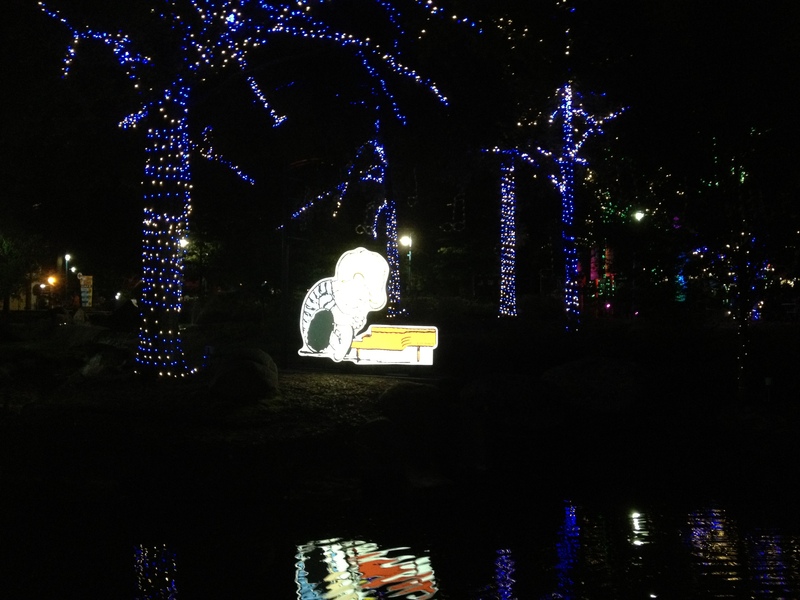 Every summer, Carowinds puts on a nightly show called Snoopy’s Starlight Spectacular where the almost the entire section has lights and light up displays of the Peanuts Characters. I do have a video of the but I cannot post it for copyright reasons but you can look at these photos. The last section of the park is one for the kids, a section devoted to those that are too short to ride the big rides and those of us that are young at heart. 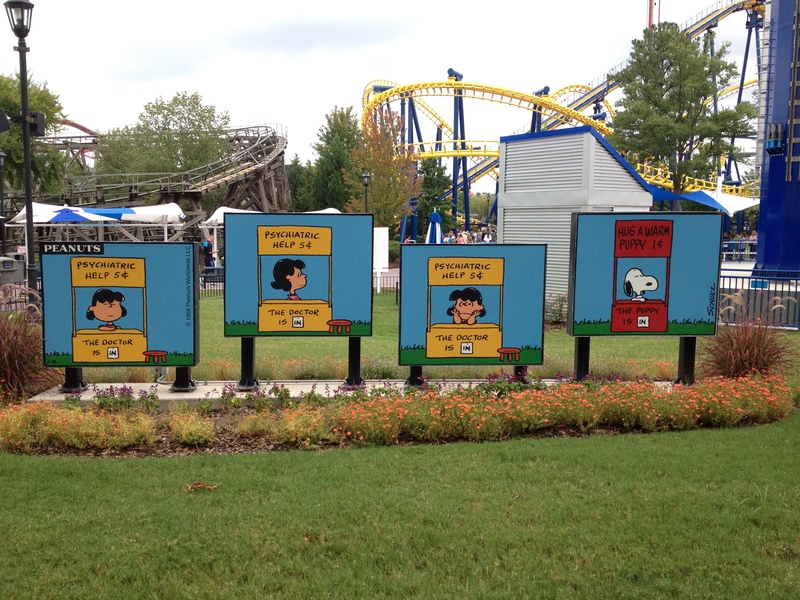 This section is called Planet Snoopy. 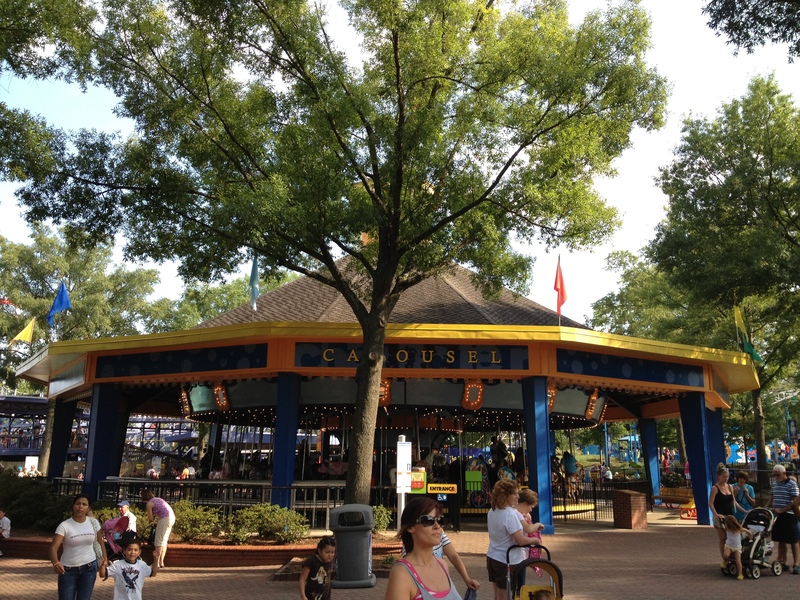 It has several rides, a classic wooden carousel, two family style roller coasters, and a fairly run of the mill restaurant called Joe Cool Café. The Joe Cool Café basically serves you standard, run-of-the-mill park food which is mainly burgers, fries, chicken strips, and sodas. Now for the rides in this area, unfortunately I didn’t photograph or shoot video of most of these attractions as I didn’t ride them. But I will tell you about the ones I did go on. 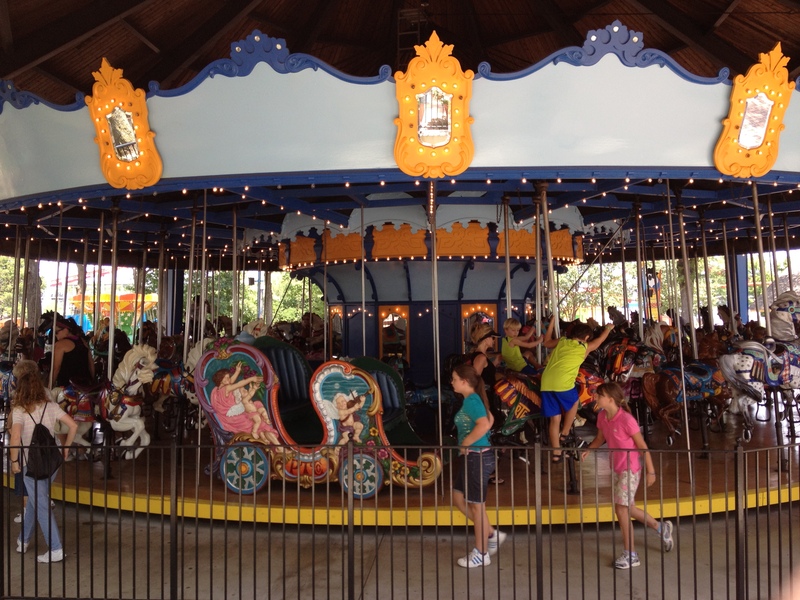 First is the classic wooden carousel called the Character Carousel. 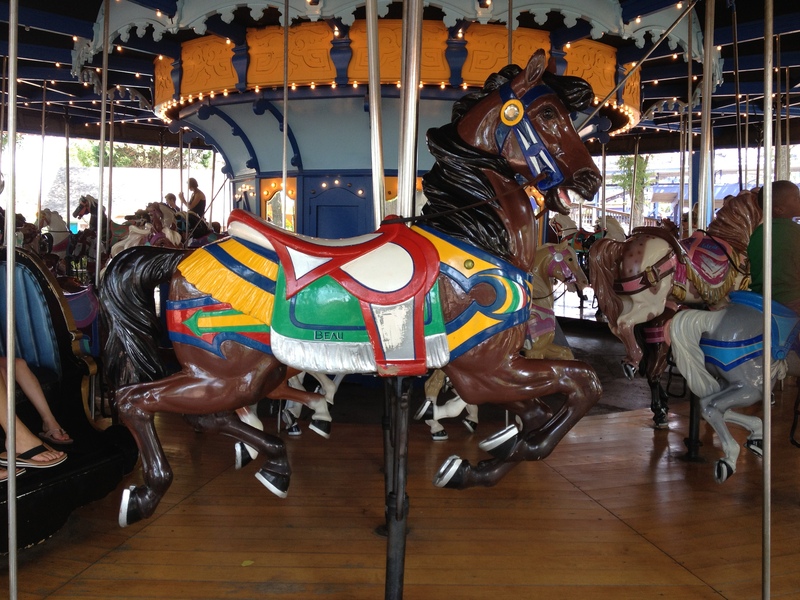 According to the National Carousel Association’s website, this carousel was built by the Philadelphia Toboggan Coasters (PTC) in 1923 and has a cereal #67. 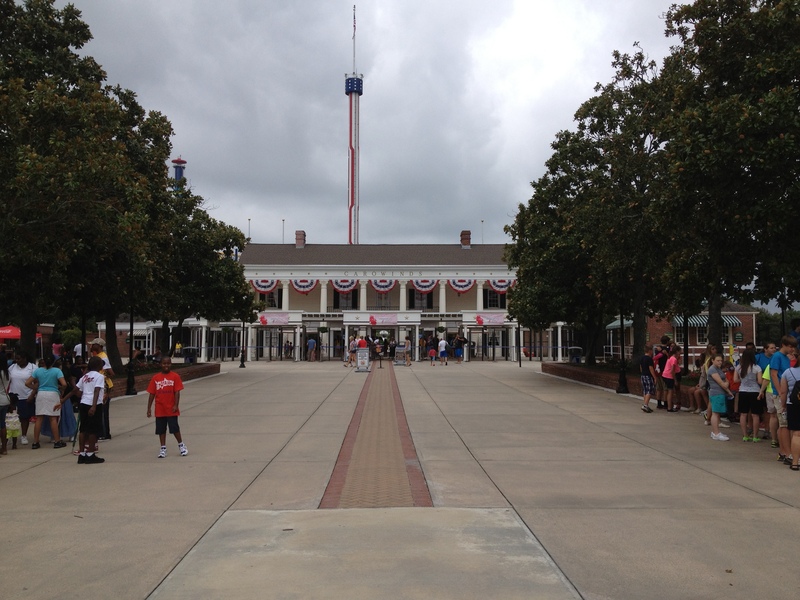 It was originally built for Pleasure Park in Evansville, IN where it stayed for just four years. 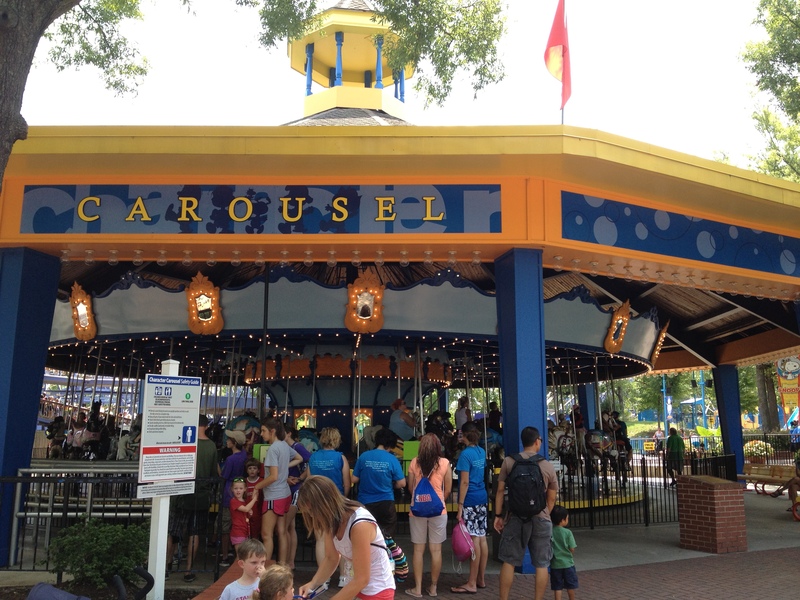 It was then moved to Mesker Park in the same town in 1936 where it stayed until 1973 when it was refurbished and moved to Carowinds where it has operated since then. Here are the specs. 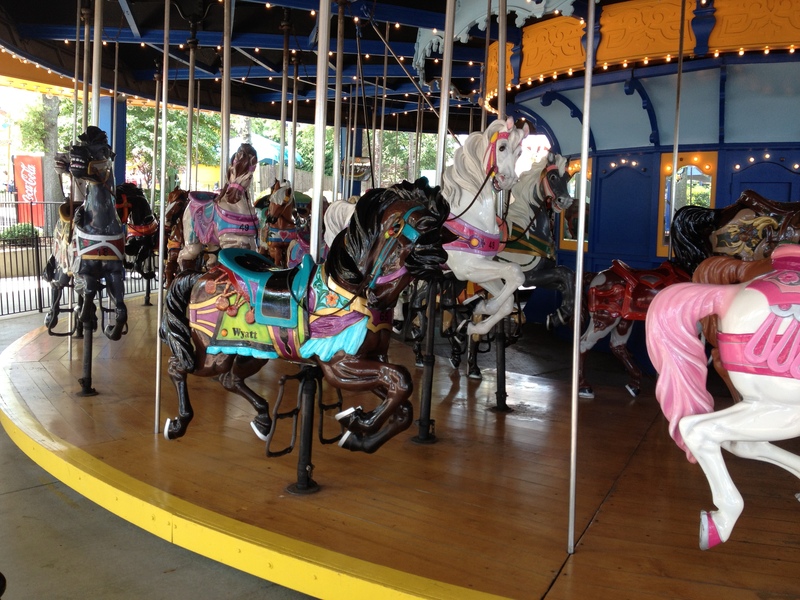 The carousel has four rows with all but the inner row being jumpers, meaning that they move up and down. The inner row is small horses that are standers and don’t move at all. In total, there are 48 jumping horses, 20 standers, and two chariots (ornately decorated bench seats). When I was there, the park was having a fundraiser for the Susan G Komen breast cancer foundation so they painted one of their horses for that cause. Next is the Flying Scooter ride from the Bisch Rocco Co called the Woodstock Gliders. Bisch Rocco has been manufacturing these rides since the 1920’s and is still in business building new ones and refurbishing their older ones. Those of you that have been to King’s Island will recognize this one as it was the Eagles Flight from the time that park opened in the 70’s. It’s been here ever since it was moved here in 2005. There is a kiddie wooden roller coaster that I did ride (just to say I did ride it) and it’s called the Woodstock Express. Unfortunately it was tucked away in a corner so I couldn’t get any good pictures or videos but I will say it was a fun little ride and I did enjoy it. 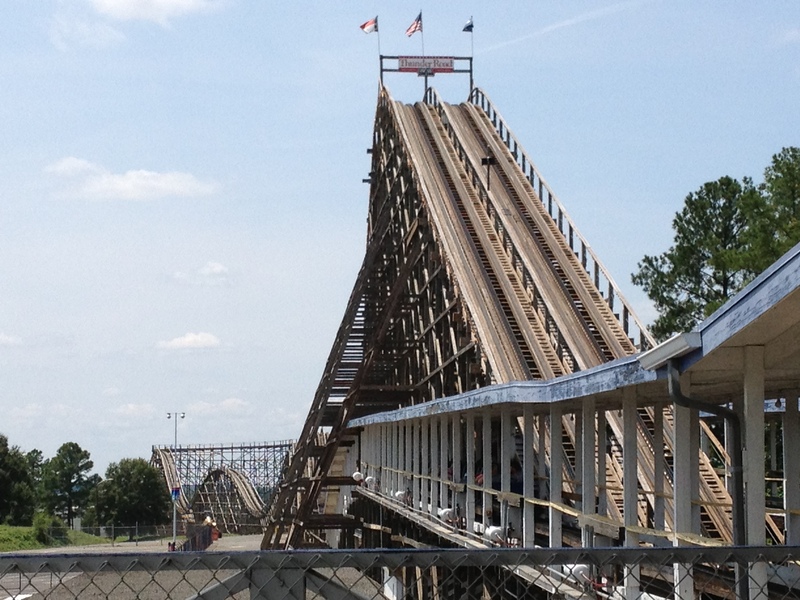 It was built by Philadelphia Toboggan Coasters (PTC) in 1975 and was designed by the venerable John C Allen. 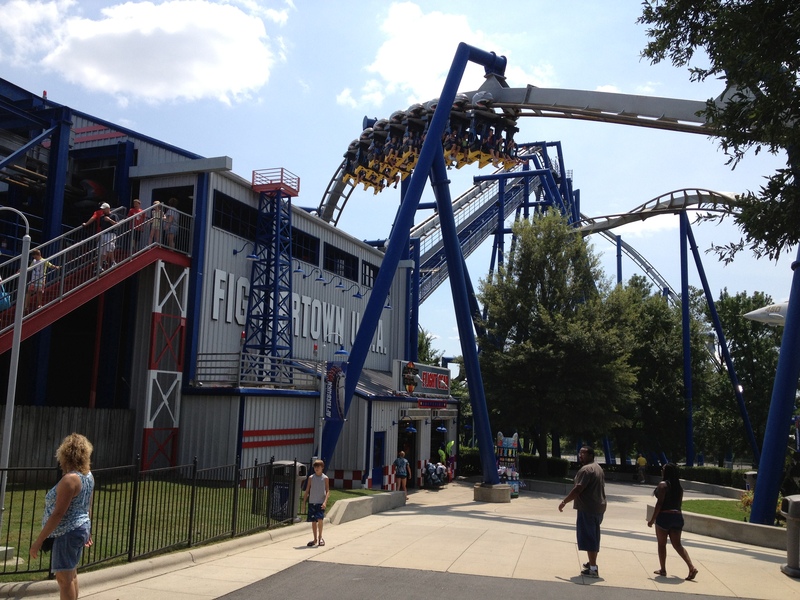 It’s serial number is 144a and has been designated by the American Coaster Enthusiasts (ACE) as a ACE Coaster Classic. 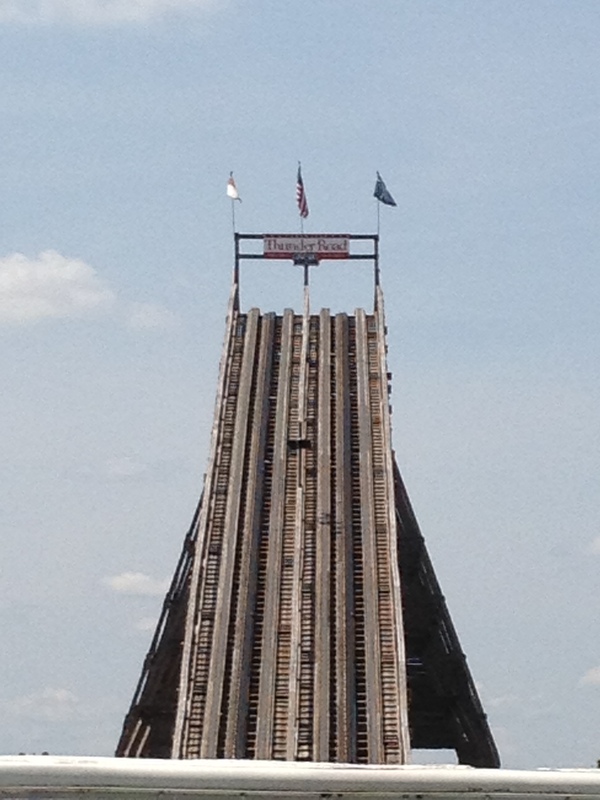 The total length is 1,356 feet, a height of 35 feet, and a top speed of 35 mph. The last ride I rode in the section is an Inverted Family coaster from Vekoma called the Flying Ace Aerial Chase. This is a coaster that the entire family can enjoy, there are no inversions, the top speed is only 26 mph, the total length is 1,122 feet long, and has a total ride duration of one minute and thirty seconds. 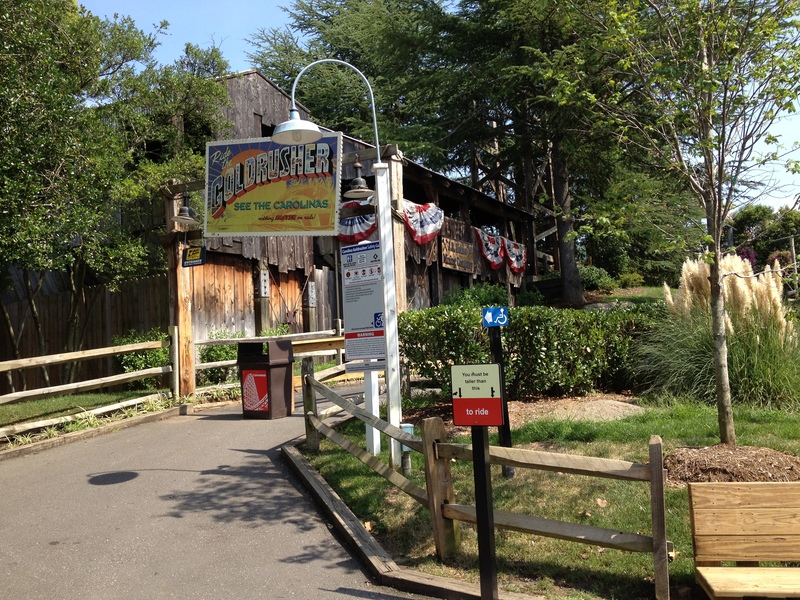 This coaster has been operating here since it opened on March 22, 2003. 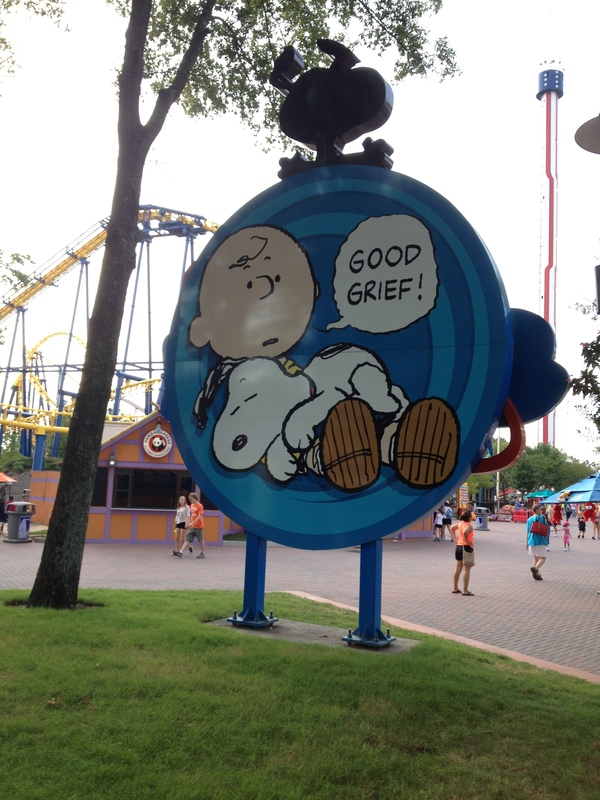 Good Grief is right Charlie Brown, that was one long review! 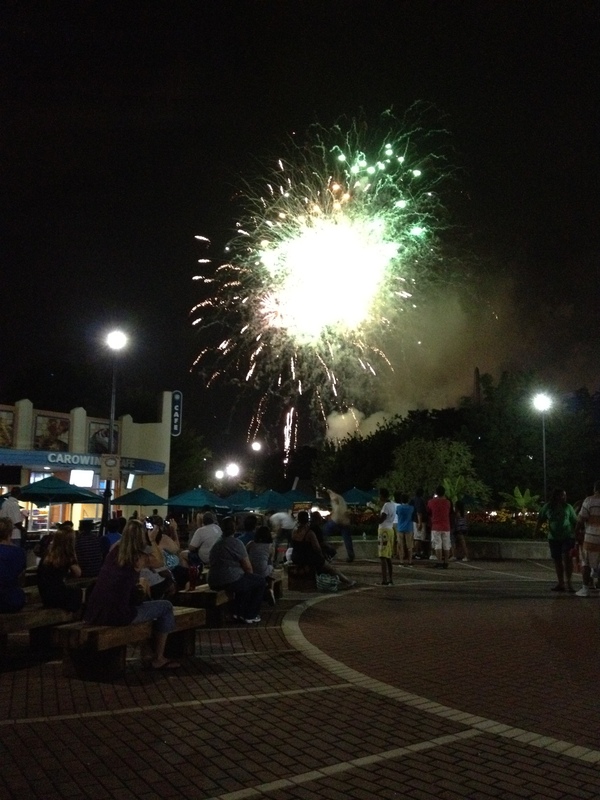 Now we come to the end of the park tour, but not before seeing some FIREWORKS! 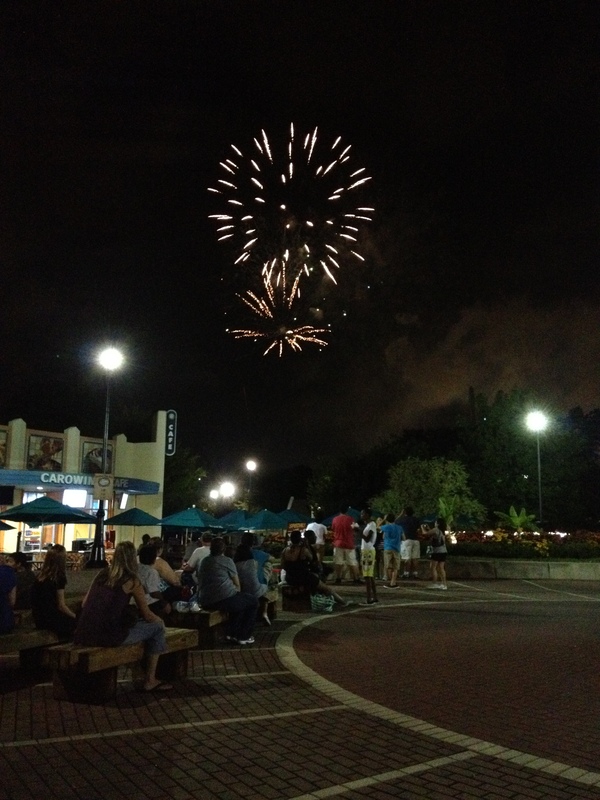 I don’t know a single person that doesn’t like watching fireworks. 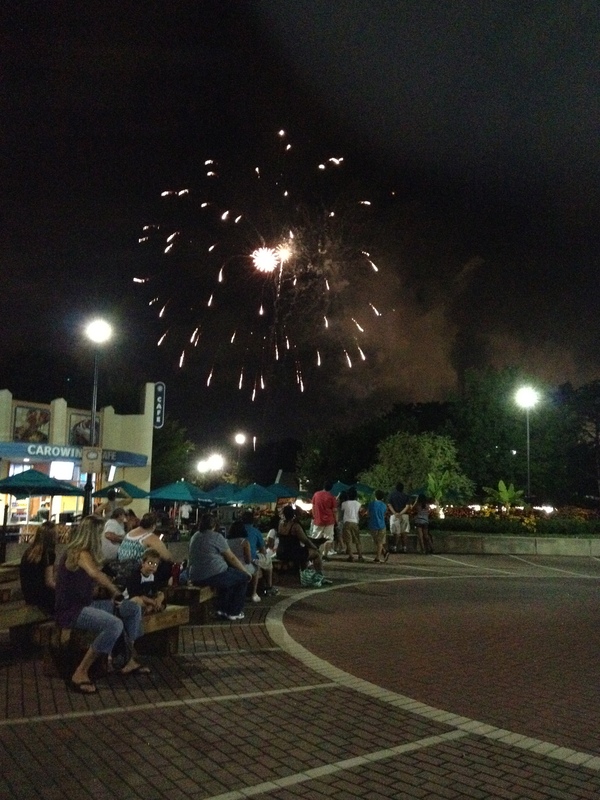 Carowinds puts on a nice show every summer at the end of the day. 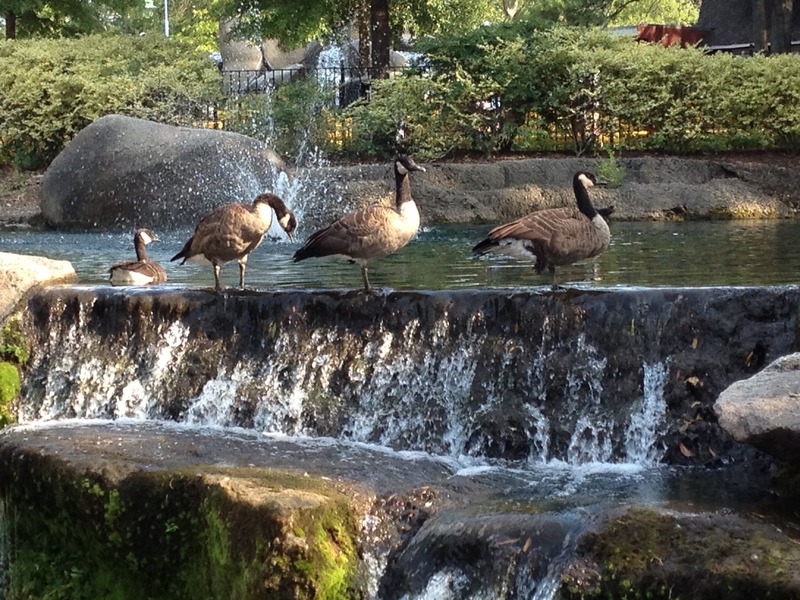 It’s a nice cap to a well spend day at Carowinds. 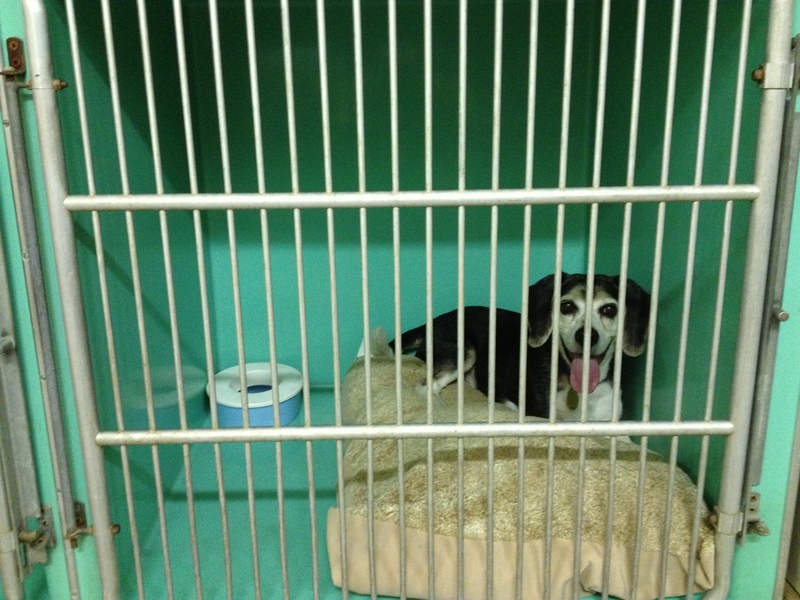 Thank you for posting pictures of the dog kennel. 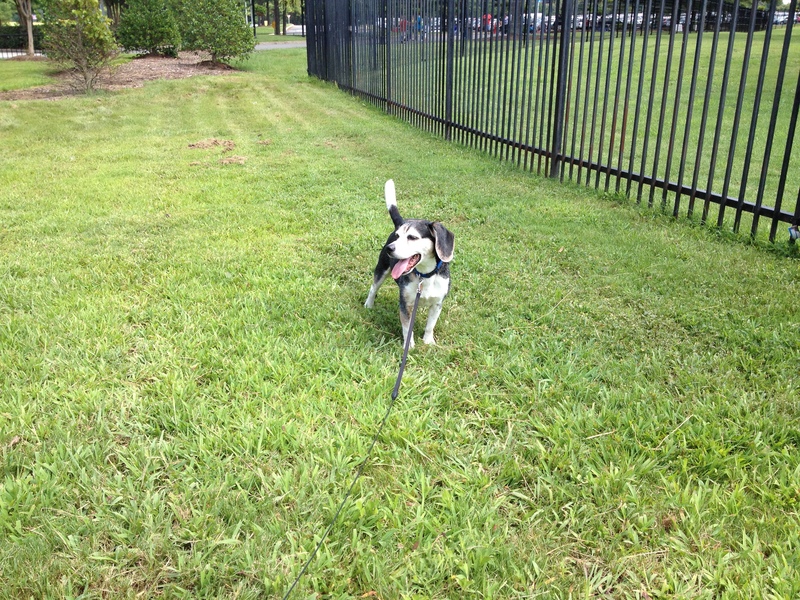 I have a dog whom I love very much and was scared to bring him all the way to the park only to find the kennel to be small and run down and have nothing to do with my dog for the dat. He gets very anxious on his own at home in his cage so being able to bring him and check up on him every few hours puts my mind at ease. 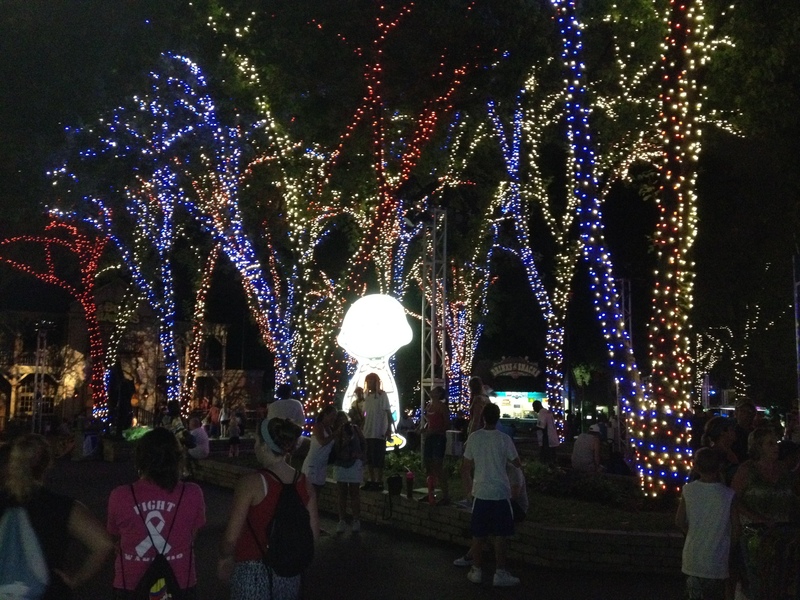 I wish the park would post some pictures like you have for people like me haha. 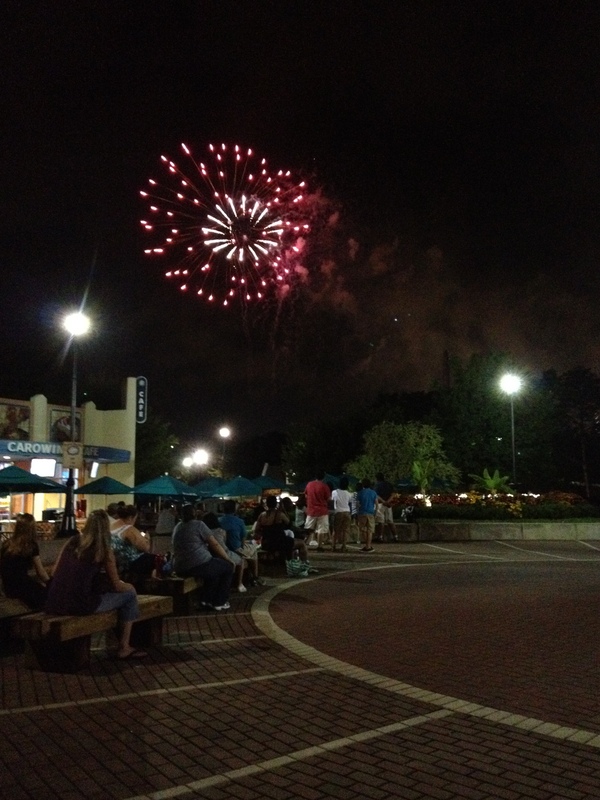 Visted Carowinds on July 27th with family after staying away for 36 years I so had fun and plan to go again!! I enjoyed this and it wa very informative, but was looking for answer to a question I haven’t yet found the answer. 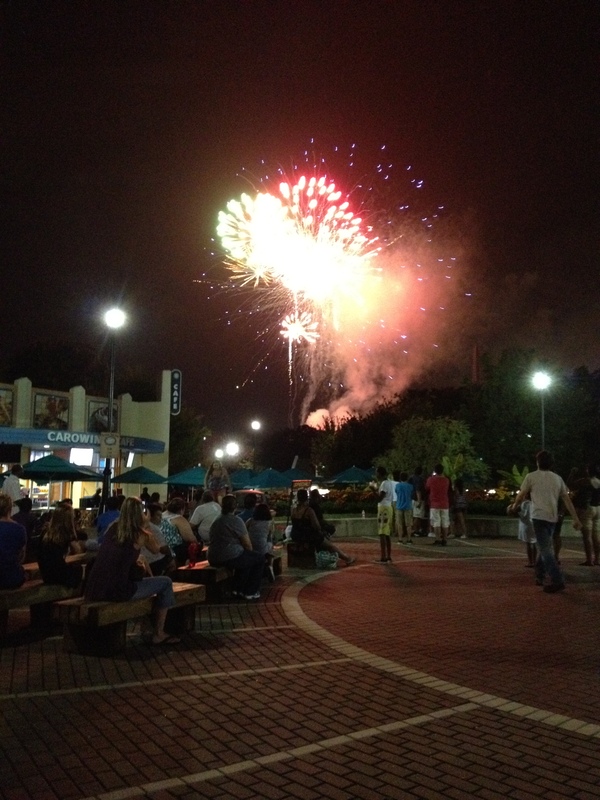 What year did Scarowinds start? Do you know? Thank you and I believe it started in 2000.